Description - This robust bird has a long narrow tail, short rounded wings and a bold white eyebrow. 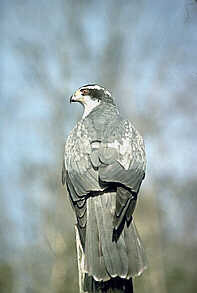 The adult is blue-grey above with a black crown with pale underparts finely barred with grey. Young birds are brown above and streaked below. Usually silent, the Goshawk lets out a loud "kak-kak-kak-kak" when disturbed. Distribution - The Northern Goshawk breeds in coniferous forests throughout Canada, wintering in farmlands, woodland edges and open country, south of its breeding grounds. Biology - This species feeds chiefly on birds and some small mammals. The nest is a large mass of sticks lined with fresh sprigs of evergreen where 3 or 4 white or pale blue eggs are laid. The Goshawk is fearless in defence of it's nest and will boldly attack anyone who ventures too close.